The visceral experience of being betrayed has triggered thoughts that consume my mind yet again. I haven't slept more than three hours straight in many months and the Benadryl I regularly take just leaves me feeling groggy. I only have two hours before I have to be in front of the first of many demanding clients today. My efforts to make it through the motions of my morning have been interrupted by my teenage daughter's demands. She desperately wants me to accommodate her schedule in order to have time with friends this afternoon. I tell her it's not going to work today. As the demand relentlessly continues, I blow a gasket . . .
An intolerable feeling of pressure rises up in my stomach. Negative emotions of frustration build and finally give way to rage. I try not to speak but I can't help myself . . . so I yell . . . belligerently. I hate myself in this space. Is this what I've become? A hare trigger waiting to be bumped- stimulating fear in those I want close to me? I wallow in pity as I'm consumed with what this affair has done to me. I found myself in these situations over and over after D-day. The smallest thing would set me off and I would spiral into a space of self-loathing. Finally, I decided to face this demon head on. The truth is my anger has been unhealthy for much of my adult life. Infidelity, like it or not, definitely shines a beaming light on any negative traits or coping skills whether you're the betrayed or unfaithful. It took me a while to realize that my wife's infidelity caused me pain, but it did not create dysfunction in me. You see, that was already there. Who knew? Turns out I'm imperfect as well. Anger is an odd emotion in that it's not just a feeling but it creates such a discomfort it motivates action. It can drive me to seek justice and truth, or, in its darkest state, can drive me to destroy. As I've wrestled with this power, I have come to understand it in two parts: the feeling and the reaction. The feeling is intense. It creates anxiety and pressure in my stomach that causes my mind to focus on a hurt or injustice in my life. At its core, it is fed by my fears. It can be intense, frustrating, and deactivate my ability to think rationally at times. This part can come out of nowhere, and without any anticipation or intention by me. This part I cannot control, I can only accept. On the other hand, my reaction is completely within my power to manage. 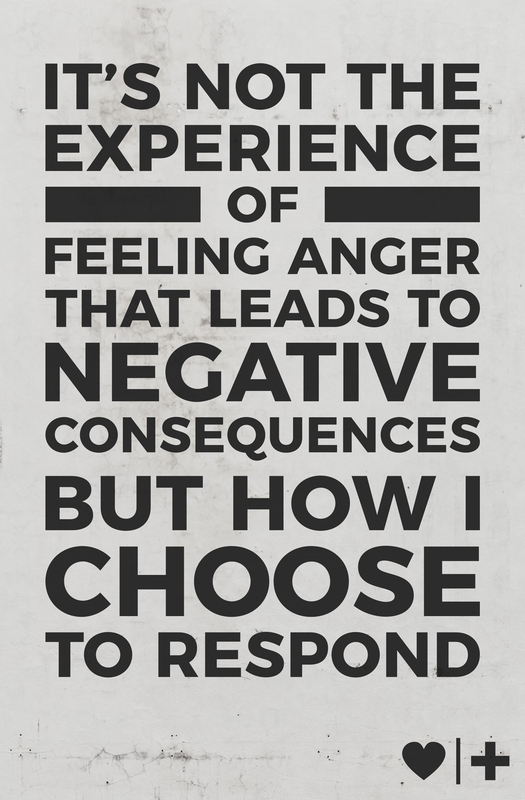 I've discovered that it's not the experience of feeling anger that leads to lingering negative consequences but rather how I choose to respond to the anger. When I acknowledge my circumstances and give myself space to experience the discomfort without verbally or physically responding, my dignity is left intact and my perspective returns without harm to my self-esteem or others. It is only when I try to transfer the pain of the emotion that I am left with regret. This seems elementary to write but I have found simple awareness is extraordinarily powerful in confronting and overcoming dysfunction. Infidelity stimulated anger in an intensity I had never felt before. I suspect I am not alone in that regard. When you feel it rising up, I hope you too can acknowledge it and find your own perspective to help keep your self-esteem in check, as it will pass again . . . it always does. It took me a long time to see it in myself too. I had a therapist tell me that often anger and rage get invoked in an unhealthy way when we feel others pulling away that we want to be close to us. This really resonated with me. I had gotten myself into a space where the more I felt my teen daughter pulling away, the more I felt my wife pulling away, the angrier I got... the destructive cycle just seemed to escalate until d-day just broke me apart. I hated myself in that space but didn't know how I had gotten there, or better, how to get out. I still struggle sometimes - I find myself getting very black and white in my thinking when I feel the urge to "gain control" of a situation, but I'm getting better. I agree completely, awareness is 95% of the battle. Just wish I hadn't had to use the experience of being betrayed to find ways to change, but when amongst all this pain might as well capitalize on what you can! I have always had a hair trigger temper and an anger that was much larger than my physical appearance. During my healing work after I was betrayed I to discovered this was a unhealthy coping tool I used to survive in my dysfunctional family. Also my anger was used to "control" situations where I felt powerless. So after working on all that and getting to a point of sort of stuck in trying to adapt my behavior I found a friend that helped me. I NEEDED a physical release for the anger I had, that was righteous anger. I am just tossing this out there for those that might want to try it. First go to Walmart/Target whatever store and get a kids t-ball bat. I suggest one with a foam cover over the bat part. They cost like less than 10 bucks. Get a notebook while you are there. Carve out a time when you are going to have 30-45 minutes ALONE. YOU HAVE TO BE ALONE. Pick a topic that when you think about it still makes you physically angry. For example the one you wrote about in the BLOG. I am ONLY guessing from the post that part of what cause ANGER when your teenage daughter is acting self-centered and demanding her own way with no regard for the struggles or scheduling conflict you face for the day is because it reminds you that your spouse was able to act the same way. That frights you and the safe emotion for you is anger to try to take control of the situation. Or maybe that is just me, but that would so me be in the same situation. And I have a 15 year old male in my house who behavior causes these sorts of triggers for me. Spend a few minutes getting to the bottom of the anger sort of like explained above in the example. Spend 10-15 minutes writing all those emotions in your note book. JUST WRITE, spelling, exact wording does not matter. FEEL THE EMOTION. Get the bat, read the letter out loud, FEEL the emotions, FEEL the anger, and then use the bat to hit an inanimate object. I use a pillow on the corner of my bed. I look into the mirror, I read my writing as LOUDLY as I need to, and then I beat the CRAP out of that pillow. Usually for about 10-15 minutes until I am physically tired. My anger and rage needed a physical release. I had to work past the anger and fear to get to the emotions I was really feeling. I have not just used it in marriage issues. It has worked great with some work issues where I have been powerless to change policy or have been wronged. After a "anger" work out. I usually try to find something relaxing and comforting to do. Sometimes I put on worship music, sometimes I pray that God takes the anger I just expressed and removes it far from me, sometimes I take the dog for a power walk to work off the adrenaline. This is just a suggestion. If you are in counseling discuss it with your professional. It has worked WONDERS for me because the discovery of my husbands betrayal blew open a pandora's box of emotions from my childhood and have made the choice to use this as my spring board to be the healthiest me I can be. HUGS to everyone on the journey. I can relate and all good ideas. Just the process of writing out my thoughts and feelings helps me tremendously (hence this blog...). When my father died years ago after a long battle with cancer I remember feeling such peace after beating a pillow to shreds. It was a harmless way to "get it out" and it really did work. Over the last year, as I have really dove into working on this weakness of mine, I have found awareness helps greatly to diffuse. I'll get a bat this weekend and keep it around "just in case." Thanks for the suggestions. I am a betrayed spouse. My despair post D-day often resulted in an anger I felt I couldn't control. How could you? What were you thinking? How did you explain this to yourself? Why do you keep telling me that there's nothing more, when there's lots more? When will we reach the real truth? When? I was full of righteous anger. I would interrupt rather than listen to the attempts to answer. I'd raise my voice, lose patience, and not let go. It didn't help me, my spouse, or us as a couple. I felt so justified, but I wouldn't take very long to regret it. It wouldn't take long to wish I could have just listened a bit more..more like a lot more. I really wanted answers, but I wasn't waiting for her to answer. My immense regret is I didn't control my reaction to the anger. At times it overtook me. Now my wife has left. Our recovery was very rough and quite raw before that. She may have left anyways. But if I'd managed my reaction to the anger she might have stayed. I'll never know. I am sorry to hear about your struggles. I would suggest balancing this struggle with grace on yourself. I truly believe the Bible put adultery as the one out of a marriage vow in script because we simply were not designed to endure the pain from this type of betrayal. All we can do is the best we can do, when we regret learn from it, but don't let it define us. Just like my wife could not control my reactions and anger, I did not choose the destructive behavior of her betrayals and lies. My prayer for you in this moment is that this process is revealing a path for individual growth and healing - for me I truly have found that is the golden opportunity in all of this pain. There were so many things about myself I was dissatisfied with before I ever experienced adultery. This has been my chance to truly slow down and evaluate me - to take a real hard look in the mirror independent of my marriage. The individual growth from that process has been rewarding. But When Are We Going To Talk About HER?